Hot and tired of tromping around theme parks at the Disneyland Resort? We're there for you. Here are the best places to catch a break and cool down. 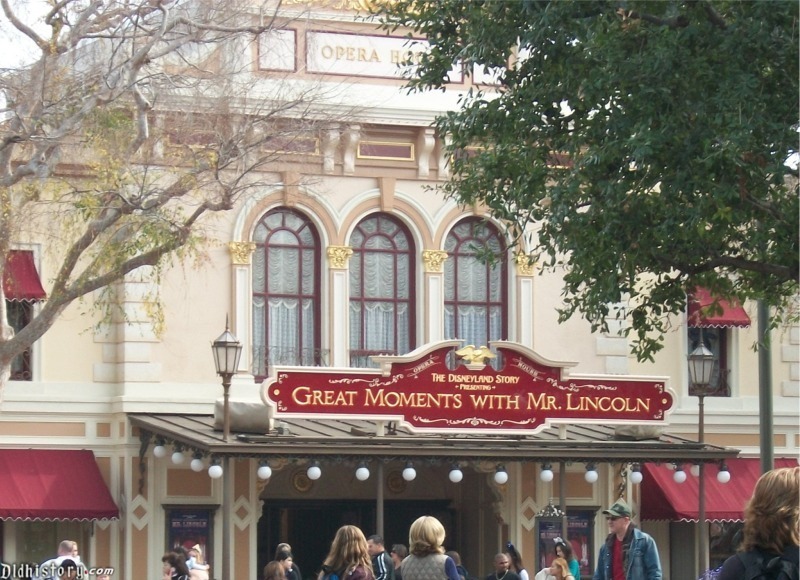 At some point, like most of us, you've probably been inside the Great Moments with Mr. Lincoln theater. Yes, it's a little dated. But you know why its moments are still great? Because you get 16 minutes of blissful, dark, uninterrupted, air conditioning in a comfy theater seat, while your aching dogs get to recover for their next line. No matter how devoted a fan you are of the Magic Kingdom, weather and long lines will ebb away at your affection, especially in the heat of summer. Acres of pavement heat up in the sun, making the temperature soar well above the temp outside the park. That's when you need a break, and savvy visitors know just where to head. Here are our best tips to take a break. As I mentioned, a great escape. There's a small historical gallery here as well. One big advantage: This attraction is hardly ever crowded, making it a good place to go to escape the thundering hordes. The down side is you must walk all the way back up Main Street to get there. If you're in favor of moving without using your feet, just hop on board and see a panorama of the park and the past, while you rest your feet and catch your breath. Take it all the way around as many times as you like, or just use it to cut some time off your hike. In the past, the entire trip around the park has taken 22 minutes, I don't know if the current reconfiguration will change that. Whatever happens, you still get to see the Grand Canyon diorama and primeval world without leaving your seat. Sshh, don't tell anyone, but this is one of my go-to spots for a rest. As a 1963 attraction that was the first of its kind, it's never crowded (the crowds at the front are usually lined up to buy a Pineapple Dole Whip). If you're lucky, you can catch a seat at the back and even get some nice, dark shuteye. Now that most park attractions are much shorter, getting an entire 15 minutes of rest is blissful. Yes, you'll get that darn song stuck in your head, but this is a blissful chance to get into some nice, cool air conditioning and sit in a boat for 14 restful minutes while cute moving dolls sing to you. What could go wrong? If you're near New Orleans Square, you might get lucky and find this vintage ride less crowded than some others, depending on the time of day. Even most of the line into the ride is shaded and cool-a big bonus. Once you get into a boat, you won't get a nap, but you will get a chance to cool off in the watery underworld and listen to yo-ho-ho for a good 15 minutes before you're forced to re-emerge into the summer heat. Try to get a FASTPASS, if available, otherwise wait out the crowds for a full 60 minutes of pleasant, cool seating and an enjoyable show. The show is pretty loud, so you likely won't get a nap, but you can slip off your shoes and relax. And maybe the fake snow will make you feel downright chilly. Take Disney cartoon drawing classes, talk to an animated turtle or other non-high-speed adventures inside this cool space. You can spend a pleasant hour in there, and it's usually not terribly crowded, either. You won't get a nap during the drawing classes, but you will get a sheet of paper, a pencil and learn how to draw Disney figures while giving your feet and blood pressure a 20-minute break. And you can take more than one class, though you must get back in line. Good for kids who are starting to melt down from overstimulation, if they like to draw. And you bring home a free souvenir from your day, too. So, you're just over your school age kids and wish they'd disappear for a few minutes? Here's your solution: Send them out to play on this fun challenge course, with rope bridges, rock climbing, ziplines and such while you kick back in the shade. True, you can't see them every second unless you do the course with them, but is that such a bad thing? The same dining principle applies over at Disney's California Adventure, where Ariel's Grotto provides a restful-if-pricey meal near Paradise Pier, while the kids are still entertained by Disney princesses and the like. It's hard to get into this place, so make sure you've reserved ahead.